The matter of grace is a real puzzle. There is obviously tension between the freedom of man and the providence of God, both of which are affirmed by the church. Right from the start, let me state that I do not think this enigma is fully solvable. Our minds are unfit to comprehend the interaction of time and eternity. Nonetheless, the problem presses its way into my restless heart. Man was created free. That is, he took pleasure in obedience, and humbly fulfilled his obligations to God. Freedom, as taught by the Church and practiced in Eden, is the unhindered ability to do what is right. It is not license to do whatever one pleases. For that which is right leads to communion with God, and “where the Spirit of the Lord is, there is liberty” (II Corinthians 3:17). However, the fall disrupted man’s perfect servitude to God. As a result, our will became disordered and our nature corrupt. What is the extent of this disorder? Just how thorough is the tyranny of sin? Jesus declared bluntly, “Verily, verily, I say unto you, whosoever commits sin is the servant of sin” (John 8:34). Paul, whose dramatic conversion revealed the regenerative power of grace, painted the picture in black-and-white: “For when you were the servants of sin, you were free from righteousness” (Romans 6:20). These are hard sayings. They suggest that man is radically unable to be good apart from God. In the fallen state, even acts of charity are motivated by calculated selfishness. Given our enslavement to sin, how then do we find holy freedom in Christ? But the great saint from Hippo simultaneously affirms the reality of free will: “Still, it is obvious that a man who is old enough to exercise his reason cannot believe, hope, or love unless he wills it, nor could he run for the prize of his high calling in God without a decision of his will” (Enchiridion, Chapter 32). This paradox sits at the heart of Christian faith. We give our lives to the Lord in accordance with His providence. We will our salvation, but only because He wills it first. Notice that this canon states that the Spirit both enlightens and compels our assent. If, then, our faith is sealed by grace, we can rightfully rejoice in the words of Christ: “And I give unto them eternal life; and they shall never perish, neither shall any man pluck them out of My hand” (John 10:28). The tension between human liberty and Divine sovereignty is dissolved in the sublime meeting of time and eternity. “For whom He did foreknow, He also did predestinate to be conformed to the image of His Son, that He might be the firstborn among many brethren” (Romans 8:29). We accept responsibility for our actions, yet our trust we place not in them, but in God’s gratuitous outpouring of loving-kindness, which was loosed by the self-emptying and self-sacrifice of the Logos-made-flesh, our Lord Jesus Christ. blood. Praise the bountiful One! the heart with dreadful ease! changing earthen beast into something glorious, unknown, godly. This is a brilliant and deep article, for which I am grateful. I read it, but still do not really understand it. A permanent problem for me is how can a good God make anything that will suffer for all eternity, be it an angel or human. I cannot resolve this problem of evil, but I consider no one else can either. All one can do is to realize we cannot understand God, who created angels, and yet very many turned against him and ended up as devils. Similarly many men seem to reject God and may possibly end up in hell for all time. If anyone would like to suggest an explanation, I would be grateful. I think Hell troubles everyone – we all wish it weren’t there. Take someone like Hitler; he was once an innocent little boy, guileless and beautiful, with a world of possibility before him. And now – while we can’t know he’s in Hell, I picked him because he’s one of the safer bets in history – he may be burning in agony forever? Was Hitler abused by his parents? How did he learn to hate the Jews, did that come from his father? Was he given a proper Catholic formation which he later rejected, or was he never trained in the first place? There are probably any number of exculpatory things that one could find about him. It all makes me want to say, instead of letting him burn, how about him, Stalin, and Mao being forced to play Pinochle in a church basement for all eternity? The doctrine of Hell is very, very troubling. Yet Jesus warns us about Hell many times, and it is dogma. We need to accept the truths that the Church teaches and seek to live our lives rightly according to them, even when we don’t like what we hear. You wrote “We need to accept the truths that the Church teaches”. I agree. I wish it were otherwise. The Holy Bible : New Revised Standard Version (Nashville: Thomas Nelson Publishers, 1989), Ro 9:20. I do not think these problems can be solved. I ponder these questions, though it profits little. How exactly the eternal, infinite, and uncreated One — outside both space and time — acts upon creatures of flesh and bone is impossible to discern. Scripture is ripe with details about God, but they are often at odds at odds with another — at least on the surface. That is why we lean depend on the wisdom of tradition and the authority of the Church. Unlike many modern people, especially Protestants, I hold the Bible to be very mysterious. It is like an expertly polished prism, breaking a single, brilliant beam of light into many wonderful colors. How are we saved? I do not know. What I do know is that much of the Church has fallen into the trap of Pelagianism — the notion that man is actually pretty good and merits paradise by being nice and helpful. That is rotten. God is Sovereign — but Merciful. And in His mercy He has made us in His own image, which means freedom. So how do His sovereignty and our freedom work together? The two wills work together because that is how He desires it. Ultimately, all we must know is that God revealed Himself fully in Jesus Christ, who humbled Himself to take on the form of a servant, even unto death on the cross. Believe in His majesty and your frailty, and repent from love of His kindness and fear of His justice. There are Scriptural and patristic reasons to believe that hell may not be eternal, but I think it is imprudent to speak of such matters lightly. I am very grateful to you for both your replies to me. I am also grateful to PH for his post and to Mary for giving us this excellent site, CL, where we can discuss in a serious and supportive way fundamental questions. Also I want to thank Mary for this excellent site , which is easy to find one’s way around and the images are excellent. 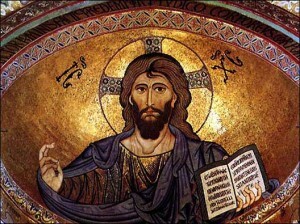 I especially like the one in this article from Palermo Cathedral, christ-pantocrator-palermo528x395.jpg. You wrote “There are Scriptural and patristic reasons to believe that hell may not be eternal, but I think it is imprudent to speak of such matters lightly.” I agree with you. One of Ireland’s foremost biblical scholars (Wilfrid Harrington OP) believes in universal salvation, as presented in his commentary on Revelation (Sacra Pagina series. A review in Amazon disagree with his views, see below. ‘(I)n wrestling with the problem of evil I had concluded that any viable Christian theodicy must affirm the ultimate salvation of all God’s creatures.’ http://www.theologicalstudies.org.uk/pdf/hick_cameron.pdf. Basically I cannot understand how a good God could allow anything made by him to suffer for all eternity. But as an ordinary Catholic I try to accept Church teaching, and there are many things I do not understand. Although some read Revelation and find a glipse of perdition, Harrington reads Revelation and finds hope for all of humanity. What these two theologians are telling us is that there will be no eternal hell, in direct opposition to the Gospels, and in direct opposition to the teachings of the Catholic Church. I haven’t studied Schillebeeckx (heard of him though) and Harrington, but it sounds like they got their licentiates with a packet of fairy dust. They’re making up a tale because they’re afraid to face the realities of their own lives, and to approach God for forgiveness. I don’t know this, mind you, but I can’t think of any other reason why a person who otherwise has faith would reject the evidence of the Magisterium and Jesus’ own words on the reality of Hell. We all want that. Everybody wants his life to mean something. And because each of us is in relationship with God, our personal choices have eternal significance, every one of them. Further, everyone has the deep-down desire to be like the heroes of stories (at least, everyone whose heart has not been corrupted by the world). We all want our chance at heroism and glory, and if we achieve it, we want it to last forever. If a good person so deeply desires to live forever, and to have his good choices mean something eternally, what then of the evil person? The only way to be fair is for him to live forever too, and for his evil choices to mean something eternally. It’s a fair test because we all had the same chance coming in – like I said, Hitler was once that innocent kid with the whole world before him. God has chosen that Hell should be eternal in order to most greatly exalt the good among us, who will live as God does, fed with the Divine life. We call them saints. If the saints are to live in eternal splendor, then the evil must live in eternal horror. (Note however that there is no necessity for evil – Hell could in principle be empty.) There can’t be a “way out” of Hell after a trillion years or so – how can the evil, who made evil choices, share in the reward of the just, even partially, or even after a long time? Everything we do for the good has a meaning that will last forever. That’s reassuring, and it’s also reassuring that God’s forgiveness is always available. There is simply no reason for anyone to fail, and certainly no excuse. That Hell is horrific and eternal is in some sense a tragedy for the whole human race, but it is also the love of God – because Hell exists on account of God’s love for his heroes, the saints. Without the possibility of Hell, the glories of Heaven would be greatly diminished, and so would the meaning of heroic love. This is a hard problem. There is scripture which taken in isolation supports annhilationism, universalism, and eternal damnation. Thus the different patristic views. The creeds do not say much on the matter. There will be judgment but to what extent…? The Catechism is authoritative and explains it this way: “Mortal sin is a radical possibility of human freedom, as is love itself. It results in the loss of charity and the privation of sanctifying grace, that is, of the state of grace. If it is not redeemed by repentance and God’s forgiveness, it causes exclusion from Christ’s kingdom and the eternal death of hell, for our freedom has the power to make choices for ever, with no turning back. However, although we can judge that an act is in itself a grave offense, we must entrust judgment of persons to the justice and mercy of God” (1861). You imply if I were in a difficult marriage I would want hell for my wife after the hell she gave me. However, seriously, here on earth people are sent to jail for rehabilitation, punishment and the protection of society. In the after-life purgatory would serve these aims, there is no need for punishment for all eternity. In Ireland life in prison means about 15 years. God is almighty. We mortals cannot tell him that he can or cannot do. I admit Origen, who proposed universal salvation, was condemned. My point is that I cannot see how a good God can condemn anything he made, which is per se good, to eternal damnation. thank you also. The Apostles’ creed tells us Jesus will “come to judge the living and the dead”, while the Nicene Creed has “I look forward to the resurrection of the dead and the life of the world to come”. There are no references to eternal damnation. I don’t want to get into an argument about “my authority is better than your authority” but I would think that the Catechism, which was promulgated by the Pope and which speaks flatly of the eternal nature of Hell and damnation, has at least as much authority as the Creeds. Also the fact that something is NOT mentioned in the Creed is hardly evidence for nonexistence – the Creed points toward without mentioning specifically such realities as the hypostatic union, angels, and Purgatory. You could make the good case that Christ’s judging the “living and the dead” is talking in part about those who suffer eternal death. Anyway, I’m with Mary. God is good, end of story. It can be hard to learn to trust him – believe me – but it’s possible for anyone. He has a glorious destiny for each one of us, for we are (while still here on Earth) his Saints-in-the-rough. Be not afraid! Noel, God is good. Perod. Can you accept that regardless of what you do not understand (see)? Of course God is good. He is the Supreme Being and consequently the Supreme Good. By definition God is absolute Good. But only by analogy do we know what goodness means. Augustine has given us a way to consider the goodness of God. It is viewed from God’s position, not from ours. A rabbit about to be eaten by a fox, does not appreciate the goodness of the fox, but the fox sees the goodness of eating a rabbit. Every sin against the 6th and 9th commandment is grave matter. I was taught that missing Mass on Sunday, without sufficient reason, is a mortal sin. The Church through various popes has taught that contraception is mortally sinful. “Any use whatsoever of matrimony exercised in such a way that the act is deliberately frustrated in its natural power to generate life is an offense against the law of God and of nature, and those who indulge in such are branded with the guild of a grave sin [ e.g. mortal]. (Casti Connubii, #56) Pius xi. In Ireland in some parishes less that 5% of Catholics attend Sunday Mass. Contraception is generally accepted by Catholics and very may people live together outside marriage. One third of children are born outside marriage, mainly to Catholics. So are those disobeying the clear teaching of the Church committing mortal sins? If one dies in the state of mortal sin does one go to hell? So does it seem most of us will end up in hell. But even if only one person ends up in hell for all eternity it is difficult to see how God can be considered good. The only answer seems to be that we cannot understand God, and we should do our best and hope that all may be well. Concerning people who are absent from Mass and practice contraception – I think it is as the Catechism says, “although we can judge that an act is in itself a grave offense, we must entrust judgment of persons to the justice and mercy of God” (1861). I believe myself that all of the evidence taken together means that we need to be sober and careful at all times, take nothing for granted, and trust God and His mercy above all else. Have you tried praying to St. Faustina, the Apostle of Divine Mercy, canonized in 2000? I also highly recommend her Diary, which is available at a Catholic bookstore. I don’t think anyone denies the existence of “hell” — that is, the torment of wicked souls. It is the exact quality of this state of being that is ambiguous. Does it endure forever? Is the pain physical or spiritual or both? Is it personal or corporate? What is the difference between “hell” before and after the final victory of Christ? Is there any difference? If God is to be “all in all” (I Cor. 15:28), how can anything remain that is not totally His? How is it “just” for finite evil to be repaid by infinite punishment? Does this jibe with the figure of Christ crucified? These are hard, hard questions. They have never been totally settled. To speak boldly, I believe the Church talked herself into a corner in some of these matters prematurely. Personally, I find the eastern Christians, for the most part, to have dealt more wisely with issues of heaven and hell. They are, generally, not so dogmatic, not so particular. The Western conception of the afterlife is at this point derived as much from Dante as it is from Scripture! As for private revelation, I do not take much stock in it. My personal devotion leans in a different direction altogether. I am grateful to you and to all who entered into this discussion. We have aired views frankly and with sensitivity. many thanks for all your contributions here. I really appreciate them. I consider ourselves fortunate that we have a forum where ideas can be discussed openly and honestly within the Catholic Church boundaries. The Holy Bible : New Revised Standard Version (Nashville: Thomas Nelson Publishers, 1989), 1 Co 4:3–5.